One of the most heard complaints about Terminal / Citrix Server environments that the session or programs are responding slowly. It is also one of the most difficult complaints to trouble shoot. Most times the user cannot explain exactly what is going slow (you will definitely recognize the answers like: everything, just slow and nothing is working) and besides many factors can influence the user experience of a Terminal Server session. One of the issues that can cause slow responses in a Terminal Server environment is the latency between the client and the Terminal / Citrix Server. A variable that is not easy to be determined. Therefore Fabrice Cornet of FCConsult created the tool Latency Checker. In this Glance at Free article I will describe the possibilities of this freeware tool. Latency Checker is single executable that does not need any installation. The tool only works in combination with Citrix Presentation Server. The intention of the tool is that it is started by the user within his Citrix session, so you need to publish the tool as Published Application or add a shortcut to tool within the desktop of the user. 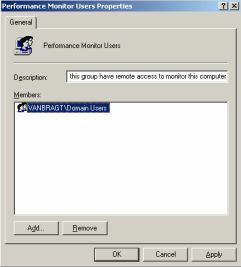 To let the tool display all the available functions the user starting the tool should be member of the local group Performance Monitor Users. As just mentioned the user should start the tool within his Citrix session. As soon the tool is running, it is starting to collect information. The data is presented in two ways. It is showed in a graphical way like Performance Monitor with lines displaying the available counters. Also the data is presented in a text oriented format in the left pane, where also more information is available about the client and the session. Let's start with this information in the left pane. Mostly the additional information can be used to identify where the client and the session are located. For example information like client name, type of connection, client IP address, resolution of the sessions and client version are available for the client. Also the name of the Citrix server is displayed where the session is running on. Followed after this information the information where the name of the tool refers to namely the latency of the session. For the latency three counters are available: last latency, average latency, deviation latency. In the left pane the values of the counters are displayed in a text format while above in the right pane is displayed graphically. In the graphical view the information is showed for a longer period, while the text part is displaying the last values only. Besides the latency the tool is also displaying more information about the server the session is running on. 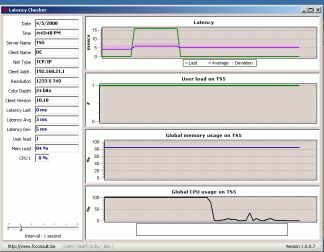 Both graphical as in text the current user load, the global memory usage as the global CPU usage is displayed. Just like the latency counters in the text format the latest values are displayed while the graphical also shows some history. The graphical overview uses a fixes time frame to display the data. When the lines are reaching the end of the tables, the tool clears these views and begins at the start again. This is different as you are used in Performance Monitor where the data is moved over, so only the first data is not available anymore. Unfortunate the tool does not have a possibility to save the collected data to a report or file (to create a report), so only the data displayed can be used. Therefore the tool will be used mostly for assisting the helpdesk for collecting some more information about the session. For further investigation by the second/third line or proof of the latency a screenshot should be made by shadow the session of the user by the helpdesk user. Determine the latency is sometimes not really easy. With Latency Checker this information is showed in both textual and graphical interfaces. Besides this information Latency Checker is displaying more information like the CPU usage, memory usage, user load and information about the client (device). It is a pity that the information cannot be saved in some way, so only with a screenshot the information can be saved.